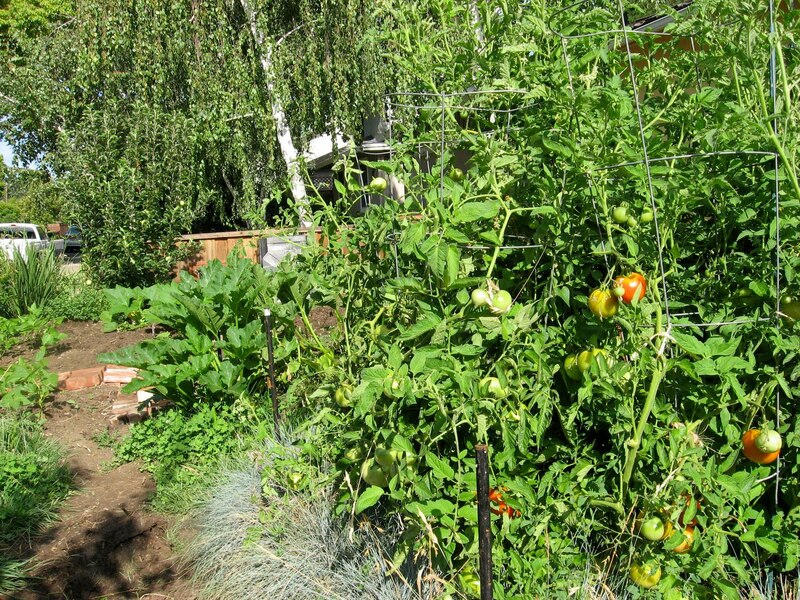 The highlight of our gardening efforts was the summer of 2009 Common Ground's Edible Landscaping Tour, (see my first blog post: Transform your garden, transform your life) which inspired us to new heights in embracing our home as a microfarm. We participated by volunteering to show our garden, and so did our friend and neighbor, James. I highly recommend it! It's a one day event and benefits Common Ground, which deserves our support for the many positive benefits they provide to our community. (Full disclosure: as a result of the fun I had on last year's tour, I'm a volunteer on this year's tour team). Photo: Enjoying the edible garden with tea time under the grape arbor. 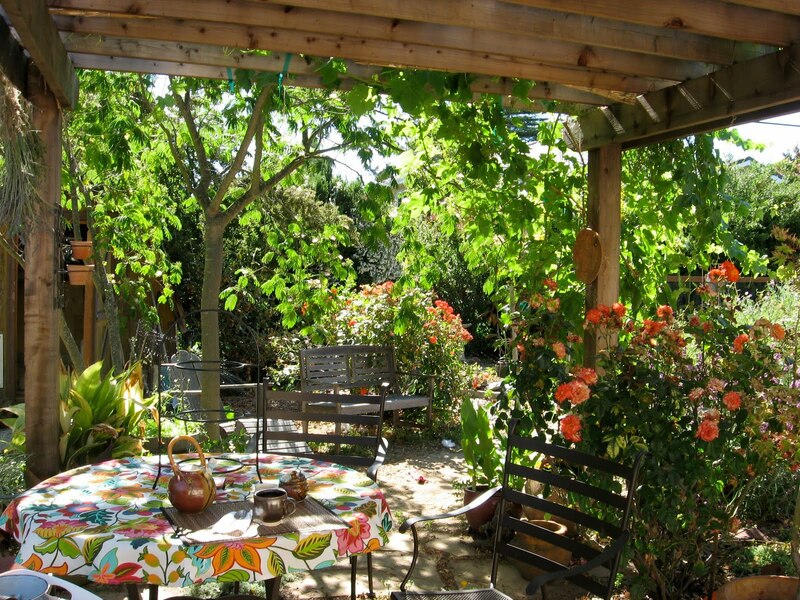 The tour is now in its fourth year, and features ten homes in Palo Alto and surrounding cities (we live in Mountain View). It takes place on Saturday, July 24 this summer. Last year, we went on a pre-tour so that we could see the other participating gardens and I was simply amazed at the creativity and variety of of the gardens. It was a lot of fun to talk to the gardeners about their experiences and vision, and to gather ideas. Many homes also kept chickens, and some had beehives. All used organic practices and composting. 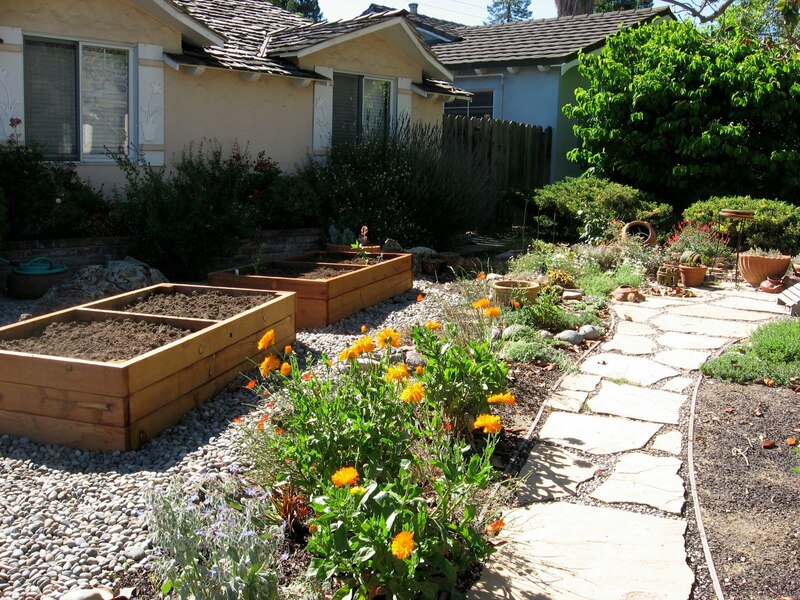 Additionally, some had systems to recycle gray water for the garden. I was thrilled that all of this was going own in our area, and the tour is a fantastic way to discover and connect with this community. I also really enjoyed showing our garden to visitors and telling them how our ideas evolved, and the special challenges we tried to design around (we have two large dogs). Our friend James inspired us into action to grow fruit and vegetables when we began to plan our garden remodel. His method was subtle but high impact. My husband and I are foodies, and James began leaving a variety of freshly picked goodies from his garden on our doorstep: bunches of fragrant basil, lovely ripe tomatoes and tender summer squash. 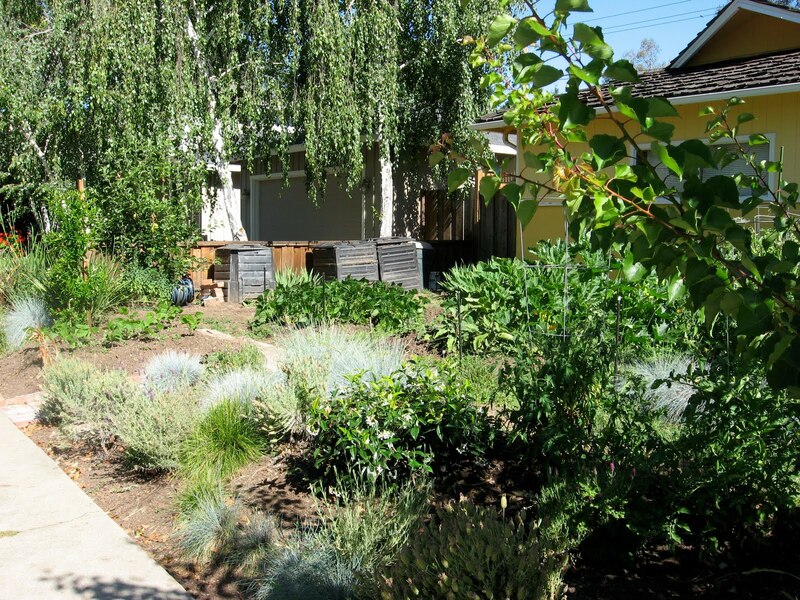 We had originally planned to redo our front and back yards with native plants and plants that thrive in our Mediterranean climate. But James woke us up to the obvious- why didn't we include spaces for vegetables and fruit? 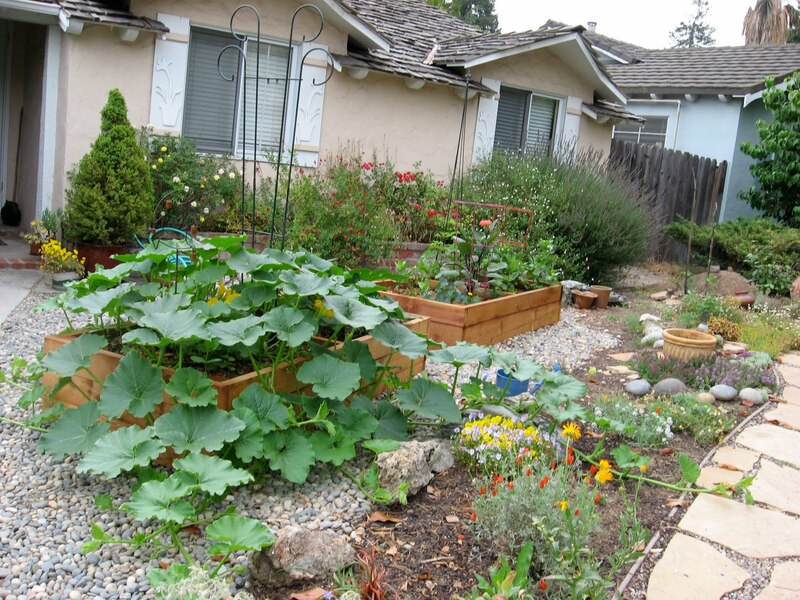 Photo: James and Claudine devote their front yard to growing fruit and vegetables for their family of five in Mountain View, California. 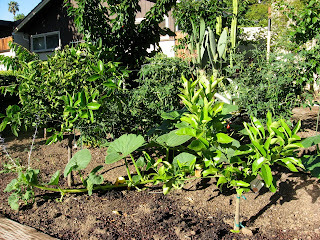 Photo: compost bins in the front yard provide fertilizer and soil amendment conveniently located near the vegetable garden. I admired James and Claudine for their unapologetic approach to microfarming in our suburban neighborhood, where at least 90% of the homes have traditional landscaping with lawns and ornamental plants. I admit I was hesitant at first to turn our front yard into a vegetable patch. We would have to install beds for planting, since the area our lawn once occupied is covered by a dense network of roots from our fifty year old magnolia tree. James successfully turned his yard into a lush cornucopia of edibles, but could we? I also hoped to promote creative solutions for landscaping without lawns by example, so we took time to plan the design around features, such as flagstone walkways and the planting beds as a solution. I'm rewarded by the many compliments I get from passersby while I'm puttering around out front. 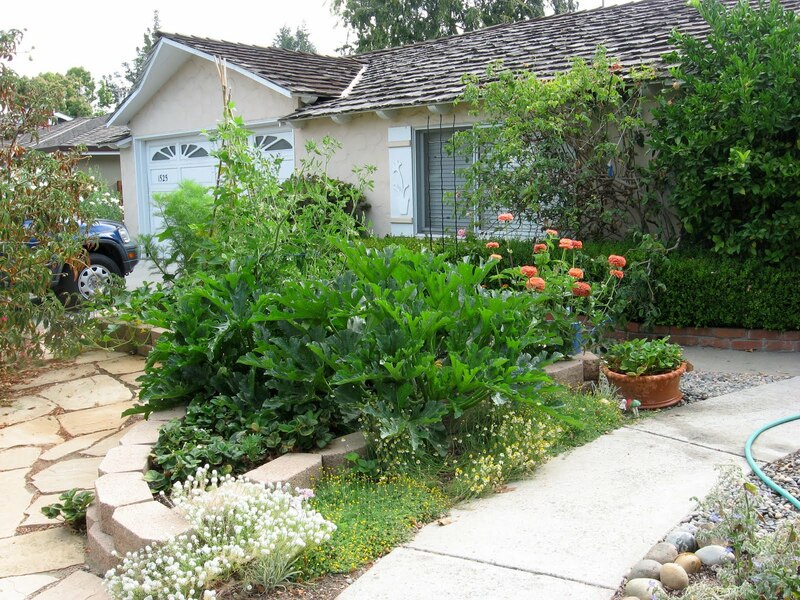 I'm now very excited about the changing aesthetic in suburban landscaping, which has to do with wise water use, reducing waste that goes to the landfill, and creating connectivity to what we eat. And did I mention I love gardens? 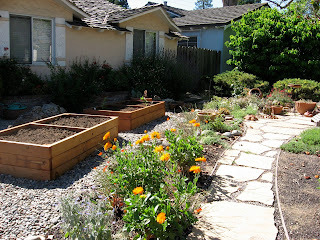 Photo: Our front yard with a planter for vegetables built with "green bricks"(Integrity Blocks). 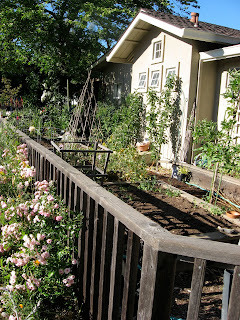 The right side of our front yard (below) with new planting beds installed in June, and already yielding veggies in late July. 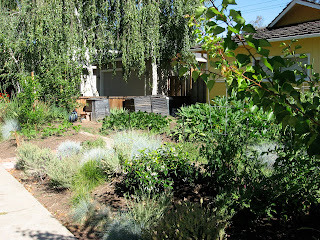 A variety of culinary herbs and flowers have been planted around the flagstone path. 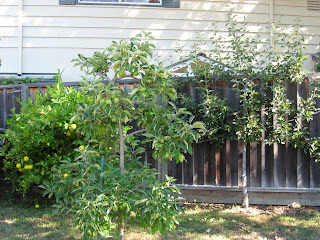 One of the Furuichi brothers (the brothers are co-owners of the Los Altos Nursery) has planted citrus, cherry and avocado trees, plus squash and tomatoes in his front yard. 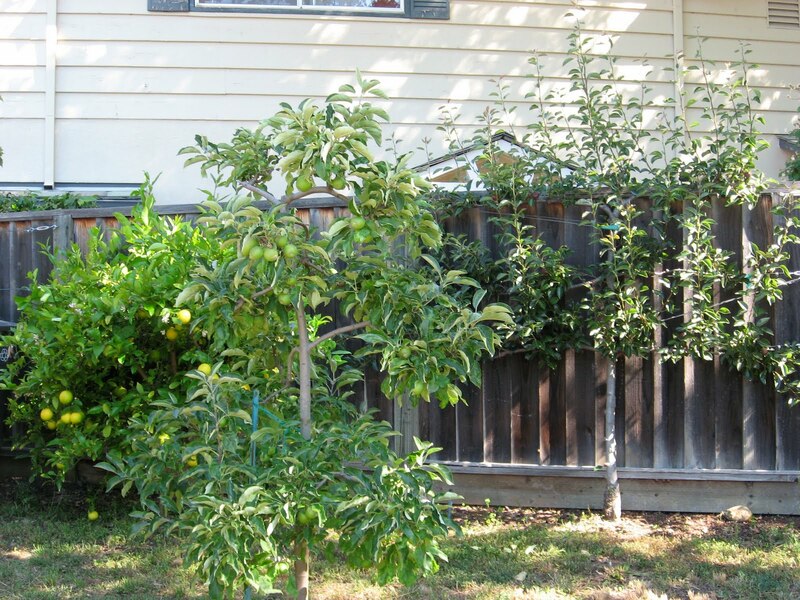 This detail view of a side yard on the corner of our block has a mini-orchard with citrus, apple and a pear tree espalier. Another corner house side yard devoted to vegetables and fruit. This one has planting beds. As James once explained: his primary motivation for growing vegetables was an "evil plot" to trick his three young children into eating more vegetables (it worked). So if you are intrigued and or seduced by the thought of growing your own, go on and give it a whirl. Be the James on your block. You just may end up transforming your life and your neighborhood.